The Gaspée Affair was a significant event in the lead-up to the American Revolution. HMS Gaspée, a British customs schooner that had been enforcing unpopular trade regulations, ran aground in shallow water on June 9, 1772, near what is now known as Gaspee Point in the city of Warwick, Rhode Island, while chasing the packet boat Hannah. A group of men led by Abraham Whipple and John Brown attacked, boarded, looted, and torched the ship. The customs service in Britain’s North American colonies in the eighteenth century had a violent history. The Treasury in London did little to correct known problems and Britain itself was at war during much of this period and was not in a strategic position to risk antagonizing its overseas colonies. At the end of the Seven Years’ War, following Britain’s decisive victory, several successive ministries implemented reforms in an attempt to achieve more effective administrative control and raise more revenue in the colonies. The Admiralty purchased 6 Marblehead sloops and schooners and Anglicized French names for these vessels from their recent acquisitions in Canada. The St. John, St. Lawrence, Chaleur, Hope, Magdalen, and Gaspee had their French accents removed and subsequent nineteenth and twentieth – century authors used the English spellings. The revenue was necessary, Parliament believed, to bolster military and naval defensive positions along the borders of their far-flung empire, and to pay the crushing debt incurred in winning the war on behalf of those colonies. Among these reforms was the deputizing of the Royal Navy’s Sea Officers to help enforce customs laws in colonial ports. In 1764 Rhode Islanders attacked HMS St. John and in 1769 they burned a customs ship, HMS Liberty, on Goat Island in Newport harbor. In early 1772, Lieutenant William Dudingston sailed HMS Gaspée into Rhode Island’s Narragansett Bay to aid in the enforcement of customs collection and inspection of cargo. Rhode Island had a reputation for smuggling and trading with the enemy during wartime. Dudingston and his officers quickly antagonized powerful merchant interests in the small colony. On June 9, the Gaspée gave chase to the packet boat Hannah, and ran aground in shallow water on the northwestern side of the bay. Her crew was unable to free her immediately, but the rising tide might have allowed the ship to free herself. A band of Providence members of the Sons of Liberty rowed out to confront the ship’s crew before this could happen. At the break of dawn on June 10, they boarded the ship. 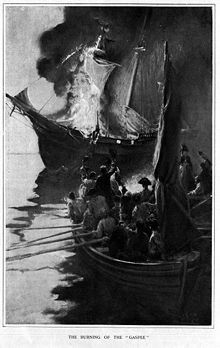 The crew put up a feeble resistance, Lieutenant Dudingston was shot and wounded, and the vessel burned to the waterline. The man who fired the shot was Joseph Bucklin. Previous attacks by the colonist on British naval vessels had gone unpunished. In one case, a customs yacht was actually destroyed (also by fire) with no administrative response. But in 1772, the Admiralty would not ignore the destruction of one of its military vessels on station. The American Department consulted the Solicitor and Attorneys General, who investigated and advised the Privy Council on the legal and constitutional options available. The Crown turned to a centuries-old institution of investigation, the Royal Commission of Inquiry. This commission would be made up of the chiefs of the supreme courts of Massachusetts, New York, and New Jersey, the judge of the vice-admiralty of Boston, and the governor of Rhode Island, Joseph Wanton. 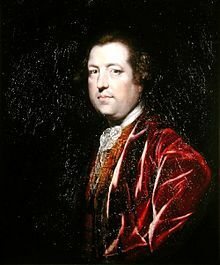 The Dockyard Act, passed three months earlier in April, allowed those suspected of burning His Majesty’s vessels to be tried in England. But this was not the law that would be used against the Gaspée raiders; they would be charged with treason. 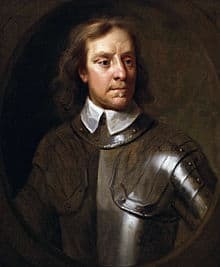 The task of the commission was to determine against which colonists there was sufficient evidence for their trial in England. The Commission was unable to obtain sufficient evidence and declared their inability to deal with the case. The city of Warwick, Rhode Island commemorates the Gaspée Affair with Gaspée Days. This festival includes arts and crafts and races, but the highlight is the Gaspée Days parade. The parade features burning the Gaspée in effigy, a Revolutionary War battle reenactment, Revolutionary War-era fife-and-drum bands, a marching band dressed as period sailors, local marching bands, and others. There is also a plaque in the front of a parking lot on North Main Street in Providence, Rhode Island, identifying the location of the Sabin Tavern where the plot to burn the Gaspee was planned.